I really love having choices at my Shabbat meals. With a group of people, especially when I don’t know their individual preferences, I want to make sure everyone is happy. I find this especially true with the dessert course. Preferences can vary so much there – some want to go a healthy route, others prefer something classic and sweet – a “real” dessert – like a nice piece of cake or some ice cream. Then you have people who just want something they can munch on. So I serve them all! I know it sounds time-consuming, but I really feel like I am making only one dessert, and here’s why: I serve a fruit, which just involves picking it out when I’m already out shopping. I make a classic dessert like a tart, cake, or ice cream, so that does involve a bit of work. But the dish I make to appease the munchers I have down to a T. I always serve B&W popcorn, even if my guests have already had it before because it’s just that good. Everyone loves it, it takes no work, it’s very affordable and makes for a stunning display. So the next time you’re planning out your Shabbat meal, or making a snack for movie night, definitely try this out! 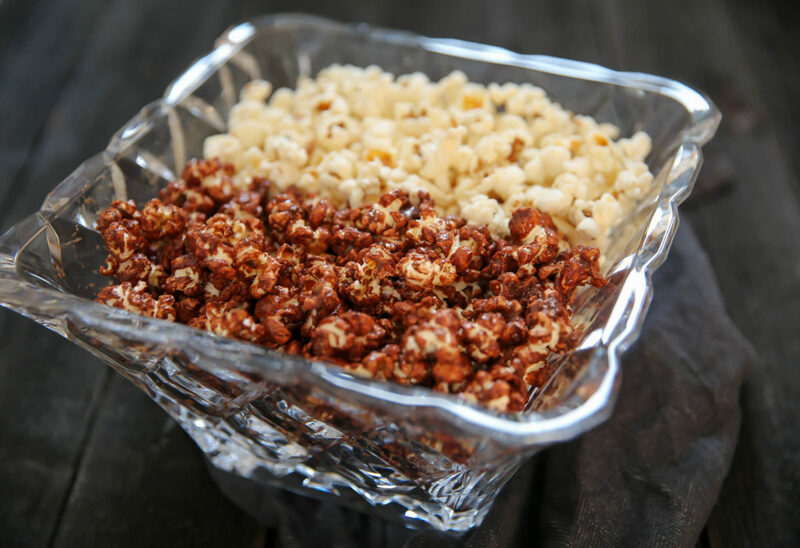 If you want to make it even easier on yourself, buy a bag of unflavored (and unsalted) microwave popcorn and just do the chocolate step yourself. Heat the 3 tbsp of oil in a large stock pot over a medium flame. Place 3 kernels into the oil. When they pop, add in the rest of the kernels, cover the pot, lift off the heat and shake around for 30 seconds. This allows for all the kernels to get to the same heat so they pop at the same time. Place back on the flame. Once the kernels start popping, slightly open the cover to let the steam out, but not too much or you will have popcorn everywhere, trust me, I've tried. 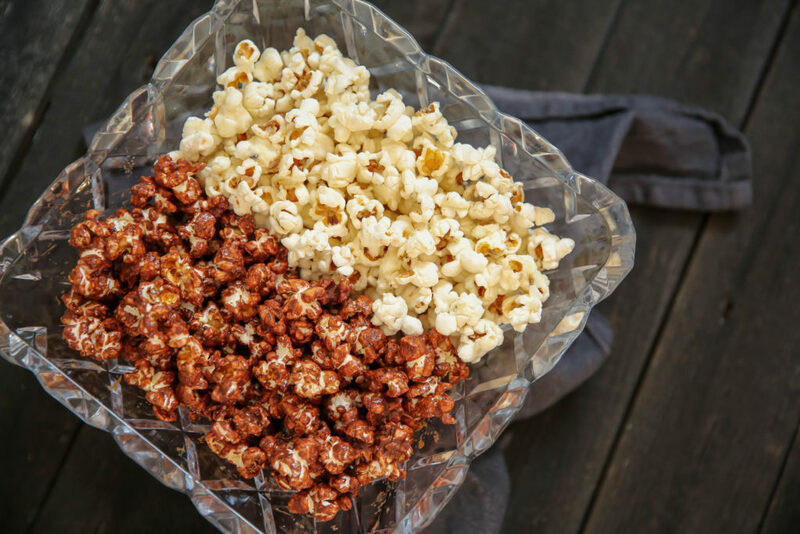 Once the popping has basically stopped, remove from the flame, uncover and transfer popcorn evenly between two big bowls. In a glass bowl/measuring cup, place the white chocolate chips first and add a teaspoon of canola oil. Place in a 300-350 oven for five minutes. Remove (don't forget its hot!!) and swirl with a rubber spatula, if the chips melt then it's done, if the chips still keep their form put back for another 2 minutes. Pour over the popcorn and mix well using a spatula. Add some maldon salt and mix well. Spread onto a parchment lined baking sheet in a thin layer. Repeat with the brown chocolate chips, adding in the cookie butter if you wish. Place in refrigerator for 1 hour and then you can transfer to a ziplock bag. Store in refrigerator.